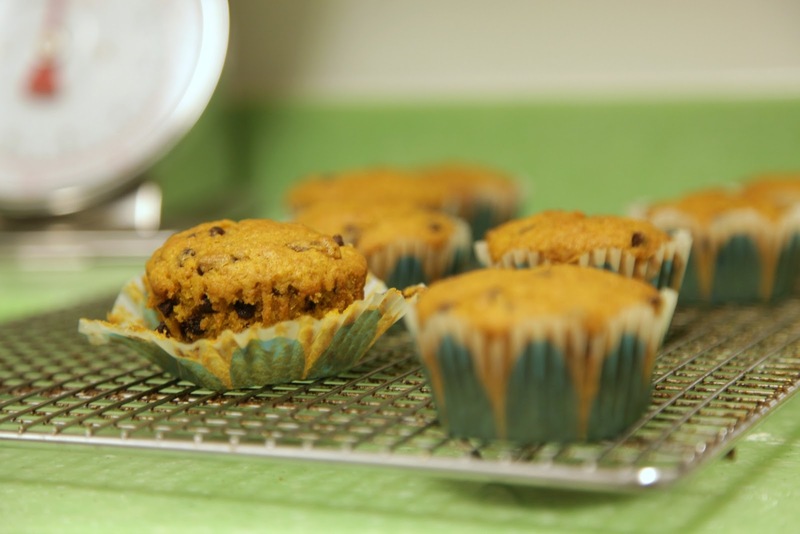 no big dill: Best Pumpkin Muffins. I Promise. Best Pumpkin Muffins. I Promise. Here at the Dill household, we have a dark secret. We admit to eating pumpkin year round. We are the ones who load up on pumpkin pack in the fall and hoard our stash throughout the rest of the year, using pumpkin sparingly to ensure it lasts until it goes on sale again come Thanksgiving. We love everything pumpkin, except pie. I think it's something about the texture, but I've never cared for it and neither has Ryan, and I don't know that our kids have ever even had it. But everything else? 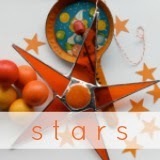 Savory or sweet, soup or cookie, bread or muffin, we will gladly include on the menu. Last week I tried a new recipe. So many baked pumpkin goods end up on the heavy side, so I was optimistically skeptical when I found this one. I made a batch to go with some chicken noodle soup and there was much squabbling over the last 3 muffins. That means they were well received. So, I made them again the next day, doubling it, but forgot I used up the rest of my powdered ginger. I am so glad I did, because I decided to add some candied ginger, and they were even better! The recipe comes from The Quick Recipe cookbook which is written by the America's test kitchen people, so you know they've done their homework. We just get to enjoy the fruits of their labor. Heat oven 375℉, spray or line muffin tin. 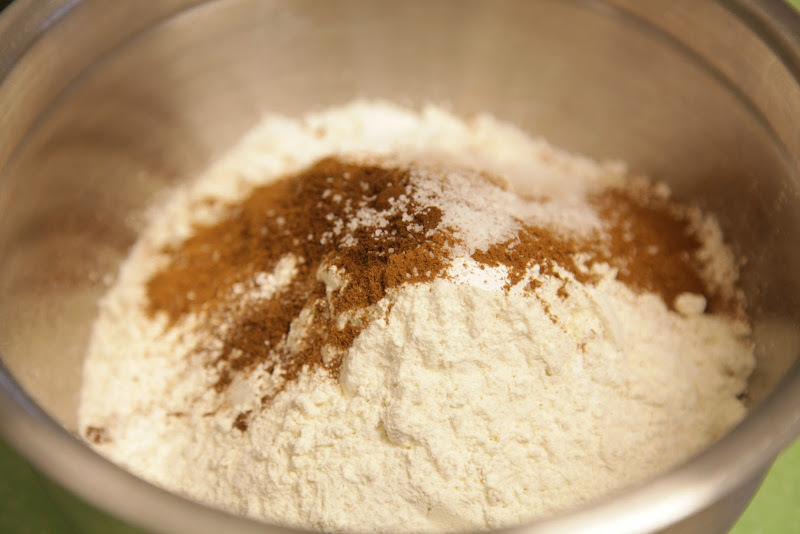 Whisk together the flour, baking powder, cinnamon, ginger, cloves, and salt in a medium bowl until combined. 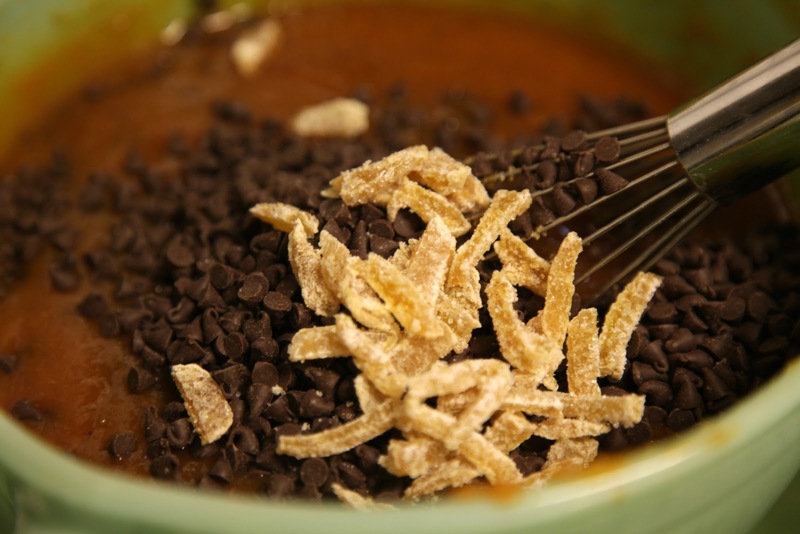 Whisk together the egg and brown sugar in a large bowl until combined. Add the pumpkin pie filling to the egg mixture and whisk to comine. Add the butter and stir vigorously until thick and homogeneous. Add half the dry ingredients to the pumpkin mixture and stir with a rubber spatula or wooden spoon until the two begin to come together; then add the remaining dry ingredients and stir until just combined (do not over mix). 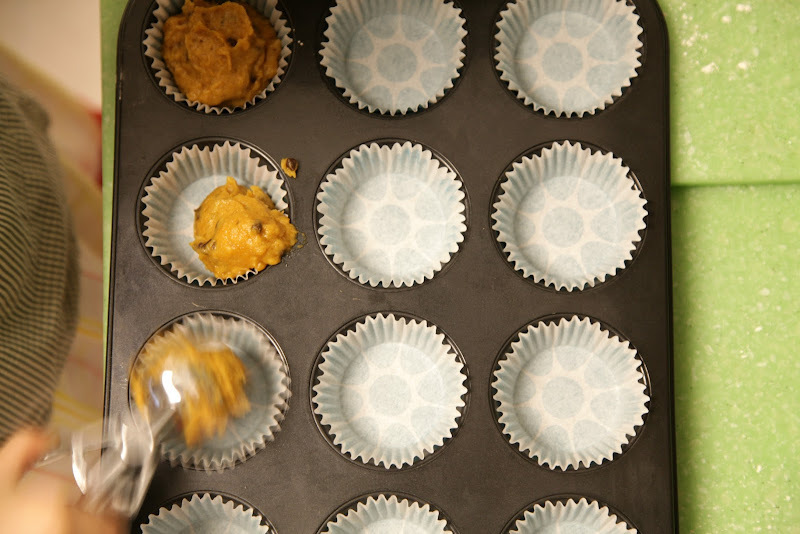 Fill muffin tins 3/4 full. Bake 16-20 minutes, until toothpick inserted comes out clean. 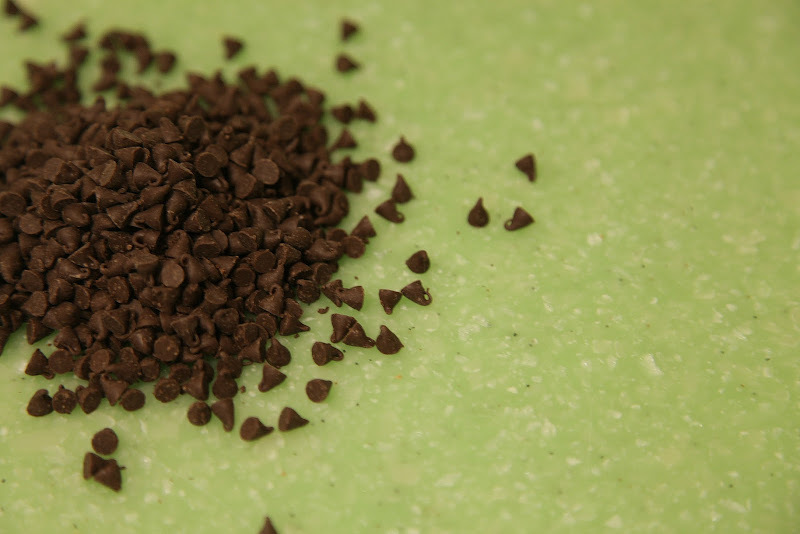 Katy notes: I also added mini chocolate chips. Just because they're good. 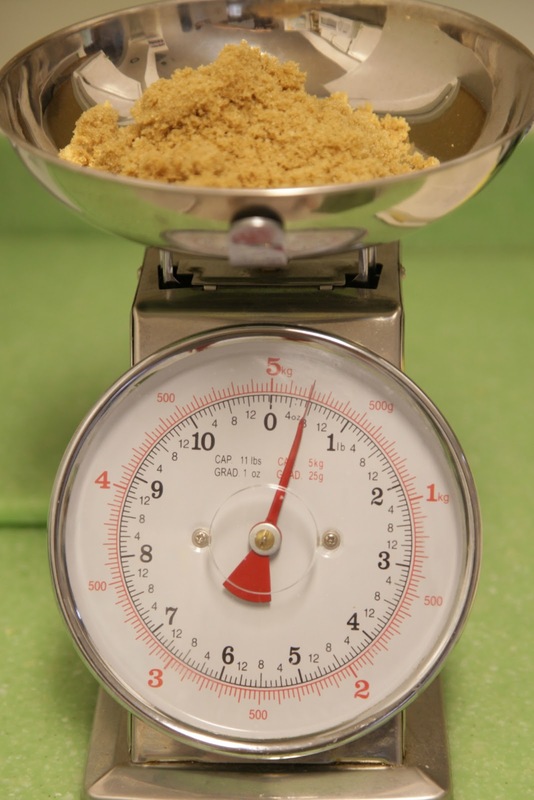 Omit ginger powder and add 1/3 cup chopped candied ginger instead (or more). Also, I didn't have any pumpkin pie filling, so I added 3/4 c of granulated sugar to the pumpkin pack and then measured 1 1/2 cups from that. I had two little helpers in the kitchen with me who took over filling the muffin cups. There. Now you know our secret. 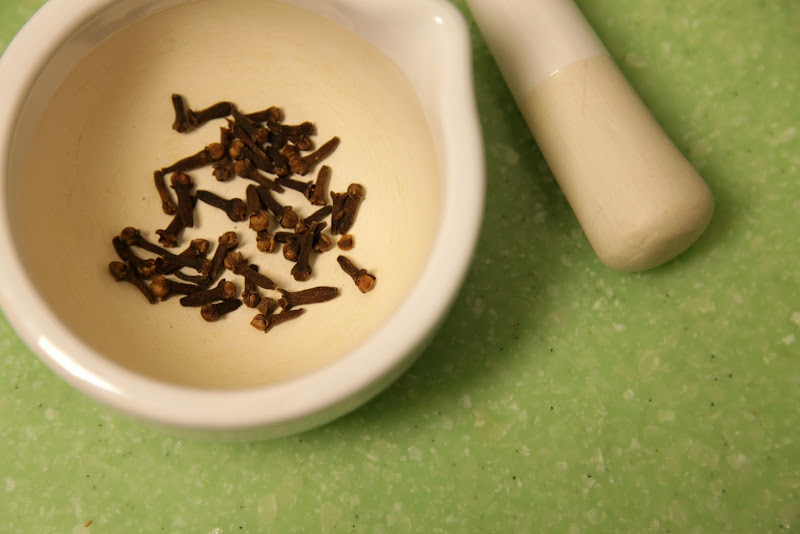 Also, don't use a mortar and pestle to grind your cloves. Completely impractical. Use the powdered stuff, or a spice grinder. I"m a pumpkin fanatic. My goal is to make out on Pumpkin by December. It's not working. Give me more pumpkin. That being said, I DO love pumpkin pie. Have you ever tried it made from *actual* pumpkin, not from a can? Or even better, butternut squash pie? Do it; it will change your mind! I hoard pumpkin year round too! This recipe looks awesome. 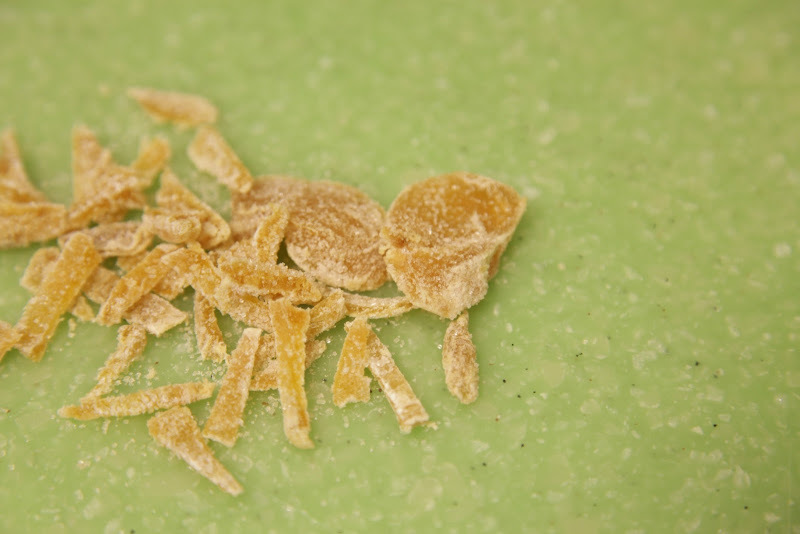 I love the idea of adding candied ginger. We are a fan of pumpkin all year round, too. I currently have about 60 pounds of cheese pumpkins sitting on my dining room table waiting to be roasted, pureed, and frozen in 16 oz containers. Yum. yum, yum, yum! I too love pumpkin but not pumpkin pie! I just got that cook book at Costco. Isn't it great? You've got to try the California Burritos with black beans and rice and chicken. Way good. No pumpkin pie for me. But I will have a muffin. Ginger and chocolate?! the best! Yum! But we LOVE pumpkin pie over here. I think Brendon would be heartbroken if I didn't make it. What is Pumpkin Pack? In Australia we don't even get tinned pumpkin, just ordinary, grown in the field pumpkins, I never know how much to substitute in recipes. I'm from Australia too and am not really sure what you mean about eating pumpkin all year round.... Isn't it available all year? Here we only have fresh pumpkin which we have to cook ourselves - nothing tinned. I love pumpkin pie though, and I have a great pumpkin pie cheesecake recipe that is always well received! Oh amen to the no pumpkin pie thing. People think I'm nuts, but now I can say that Katy Dill doesn't like it either, so there! I do love all pumpkin baked goods though, and I'm a huge ATK fan. Will be putting this book on the Christmas list fo sho. My husband used to tell me that I was strange because I love pumpkin bread and muffins but not pumpkin pie. 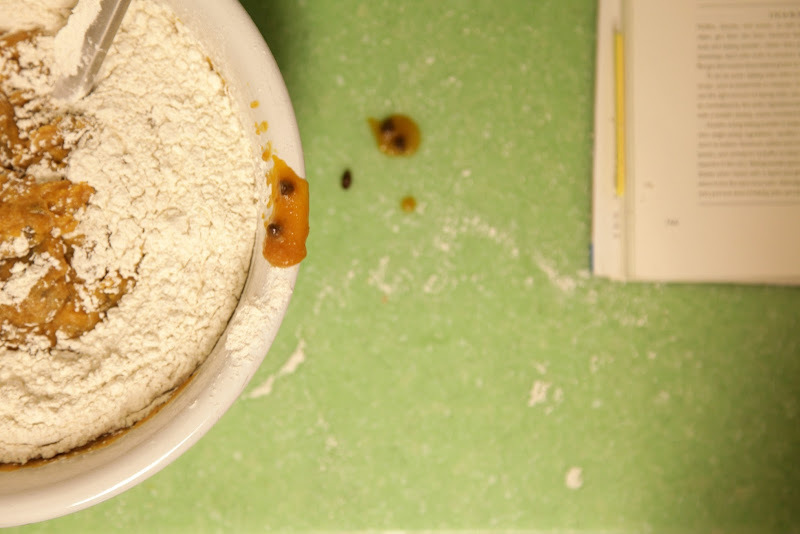 but then I happened upon this recipe http://katiebrownhomeworkshop.com/recipes/nutty-caramel-pumpkin-pie/ this is the only pumpkin pie I like, it might be the pudding or the graham cracker crust. I don't put pecans in it because my hubbie has "issues" with nuts in things, not like allergies just "issues".